While looking for new listening ideas earlier this summer, I found myself perusing the 2015-2016 programs of a few orchestras to see what composers and pieces were being played around the country this upcoming concert season. After reviewing a few season programs, I decided to do a more thorough study of a number of American orchestras examining their programming of music by living composers. The following survey examines the programming of the 2015-2016 Classical/Masterpiece concert series of 21 prominent American orchestras. It’s important that I preface this by noting that this survey assesses only the full orchestra’s primary concert series and does not include chamber music concerts, pops concerts, special events (Ben Folds, Seth MacFarlane, etc. ), programs by visiting orchestras, or dedicated new music series that most often utilize a subset of the full orchestra (such as LA Phil’s Green Umbrella series or NY Phil’s CONTACT series). The figures here reflect the season programs as published in each orchestra’s brochure or on their website as of mid-July 2015. A small percentage of surveyed programs are incomplete or still-to-be-announced. It’s not surprising to see Los Angeles Philharmonic top this list given their exemplary commitment to the music of our time in their recent season offerings. It’s worth noting that the Minnesota Orchestra’s numbers are elevated by its excellent Composer Institute, leading to the programming of seven works by young composers. Baltimore was also just awarded a project grant from NewMusicUSA to support ten centennial commissions to be premiered during their 2015-2016 and 2016-2017 seasons. 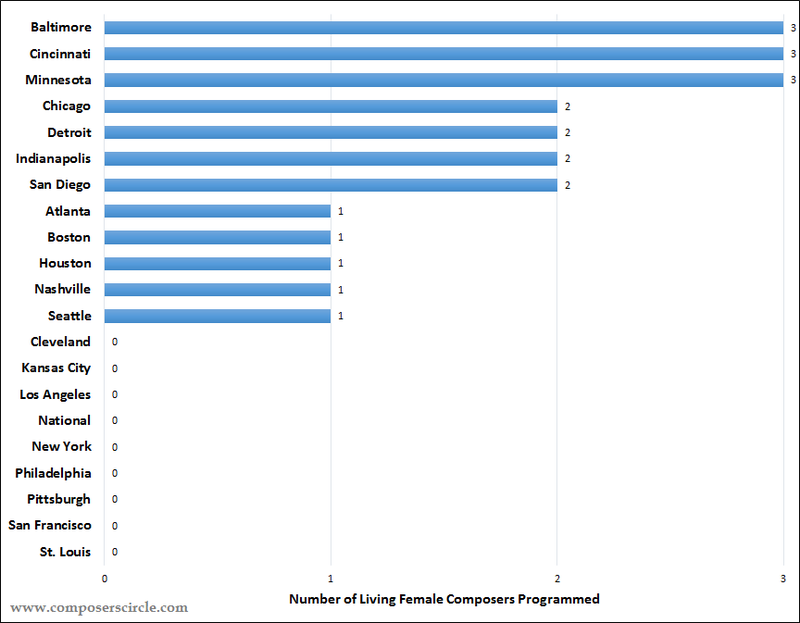 Closer examination reveals that there’s little diversity in the already-limited programming of living female composers, as more than half of the data in the chart above can be attributed to just four composers: Jennifer Higdon, Anna Clyne, Gabriela Lena Frank, and Sarah Kirkland Snider. 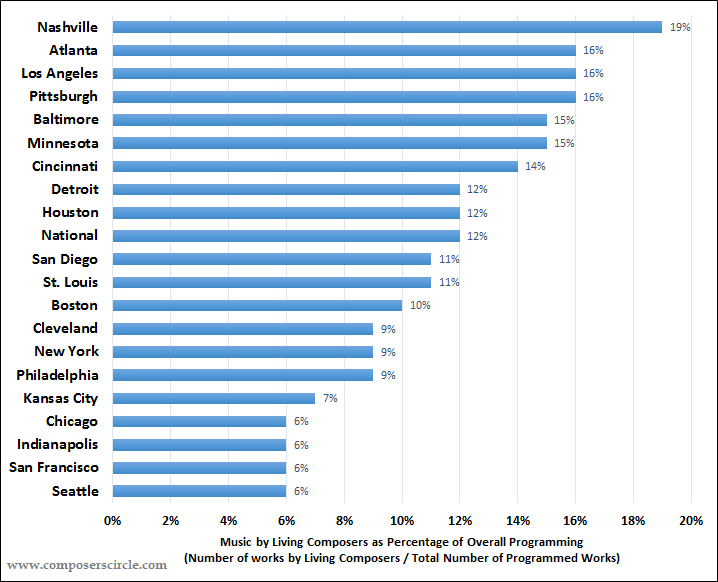 Lastly, I examined the number of works programmed by living composers as a percentage of overall programming for each orchestra. 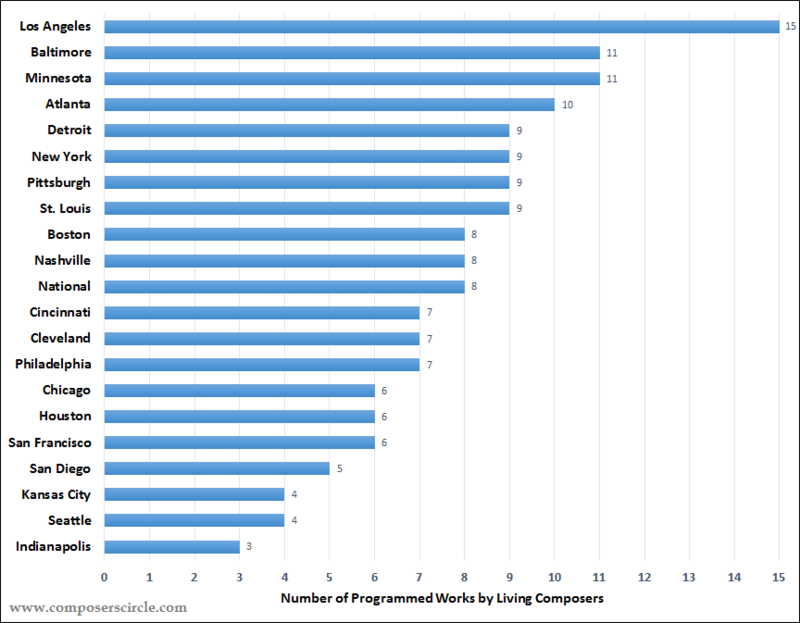 These percentages were calculated based on quantity of pieces; in each case, I divided the number of programmed works by living composers by the total number of programmed works. Duration isn’t factored in due to unavailability of data, but I suspect that if it was, it would result in significantly lower percentages across the board. Overall, music by living composers makes up about 10.9% of the programming of all 21 orchestras combined (162 of 1,486 programmed works). 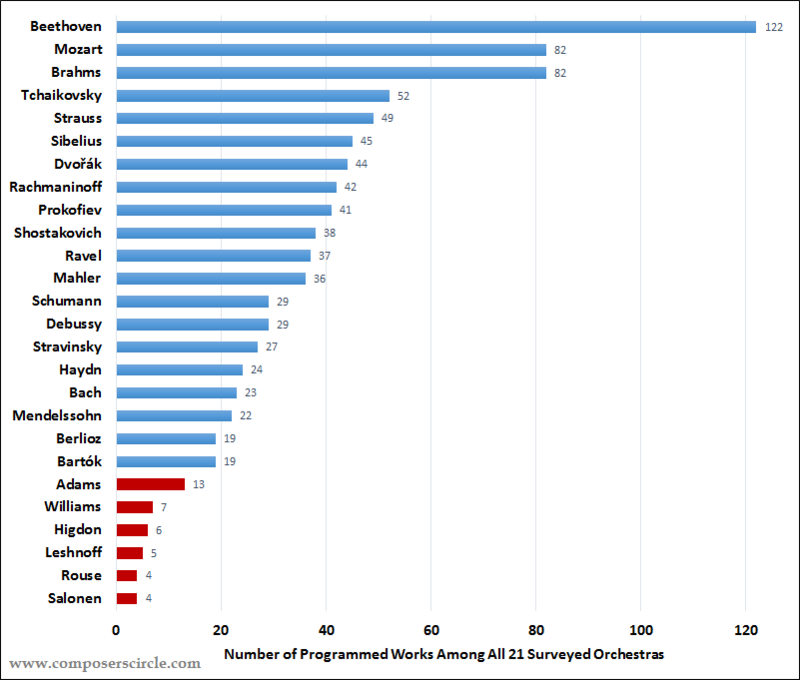 Beethoven, Mozart, Brahms, Tchaikovsky, and Strauss collectively account for more than a quarter of all programming (387 of 1,486 pieces), while more than half of all programming is limited to the 20 most frequently programmed composers in the chart above (843 of 1,486 pieces). Overall, the study more or less confirms what most people in the classical world already knew: the music of our time occupies a relatively small portion of the music heard in America’s most prominent orchestral halls. Of course, there are some great things happening with new music in the orchestral world, too. The American Composers Orchestra is providing more and more valuable opportunities and collaborations for emerging composers each year, the Cabrillo Festival is doing great work promoting orchestral music by living composers, and the New York Youth Symphony gives the Carnegie Hall premiere of a commissioned work by a young composer on every concert, just to name a few. Still, given that America’s most prominent orchestras are among the most widely visible classical music institutions in our country today, should we be asking more of them regarding music being written today? If so, what should we be asking? How should we be asking it? What do you think? Feel free to share your thoughts and reactions in the comments below, and thanks for reading. We’ll will be back with fresh daily new music tomorrow! This is a very practical comment. Not snarky at all. I think a LOT of the answer lies in how much it costs to perform these pieces. Let’s face it, within the context of an orchestral season, Beethoven is essentially free to perform. The size of the orchestra falls within the hired ranks, the music is free (doesn’t have to be rented), and it basically markets itself. Hi Jim – True, contemporary works are more expensive to program, but when you’re looking at orchestras with an annual budget of $109 Million (LA Phil) or those with an endowment of $413 Million (Boston), the cost of renting and licensing works by living composers seems relatively minimal. The lists don’t seem to distinguish John Adams from John Luther Adams. Aibell – All of the “Adams” on the various charts are John Adams. 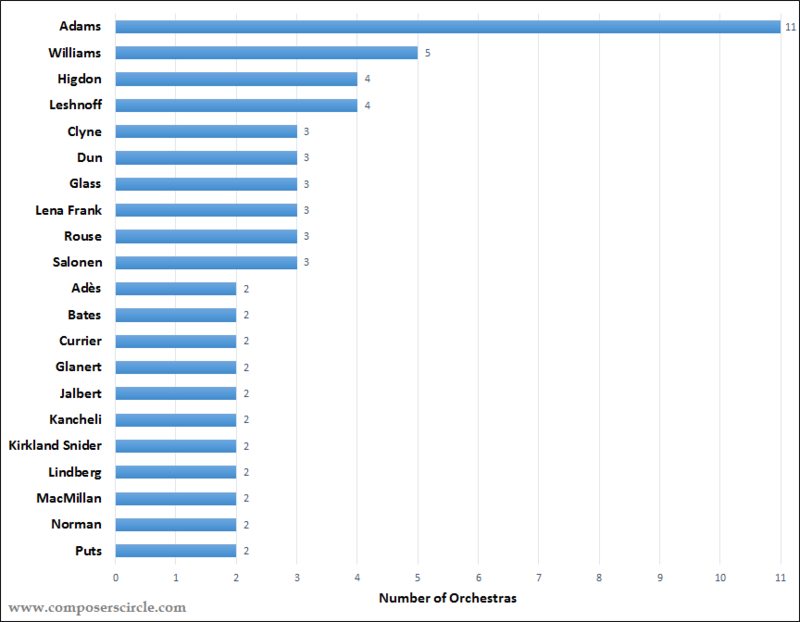 LA Phil is the only orchestra of the 21 surveyed that is doing a John Luther Adams work this coming year, as indicated in the full list. Also of note, being performed in Chicago is Elizabeth Ogonek, who should be included with the women composers. I know that this orchestra is much smaller than the others cited here, but you might include the Albany Symphony in your next such survey. The programming here compares pretty favorably to many of the orchestras listed here. 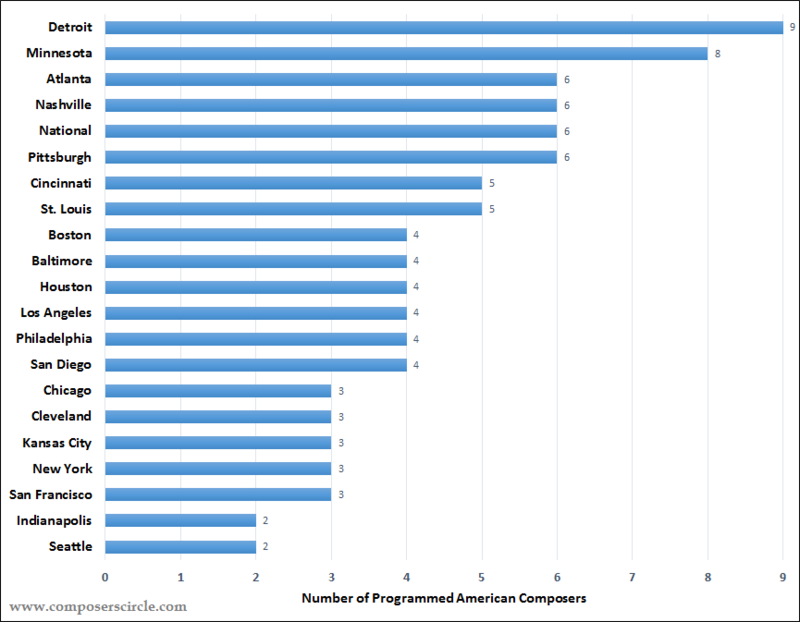 Number of living composers programmed – 14 (or 9, depending on whether you count Sleeping Giant as being one entity, or 6 individual composers). Living American composers programmed – 13 (8). Always interesting to read about metrics like this, thanks for compiling it. Commissions are certainly important, but if composers are serious about making money as a composer (outside of teaching) then emphasis should be placed on selling scores. I realize that making money isn’t necessarily what this article is about! But, in case it matters to a few..the educational sector is the largest marketplace for purchasing scores. In order to increase score sales, a good tactic for composers is to market their scores to distributors who can get it in the hands of educators. Or, we think, better yet, get commissioned by a youth ensemble and let the music directors speak for you — word spreads fast about good scores. Attend educational conferences and meet music directors in your area. A composer may even find themselves on stage at the Midwest Clinic with 700 schools in the audience listening to their new work and considering it for their next program. We’re proud at the DSO to work with great living composers, particularly American composers, and we’re even more excited to showcase all of our living composers on our free Live from Orchestra Hall webcasts at http://www.dso.org/live. We’re giving new music a worldwide platform!